Minto Group Inc. - What’s coming next to Arcadia? As we’re nearing the next release of Arcadia, living in the heart of Kanata’s entertainment district is about to get even better. Live outside of the city, closer to nature, surrounded by Kanata’s excellent amenities – all while being within easy access to Highway 417. We’re excited to welcome future Arcadia homeowners to the community! Our talented Land Development team is hard at work on the next phase that will connect seamlessly with the existing Arcadia neighbourhood and back onto the Carp River. You have easy access to the community park with a play structure, a basketball court, and an open sports field that is converted into a skating rink in the winter. 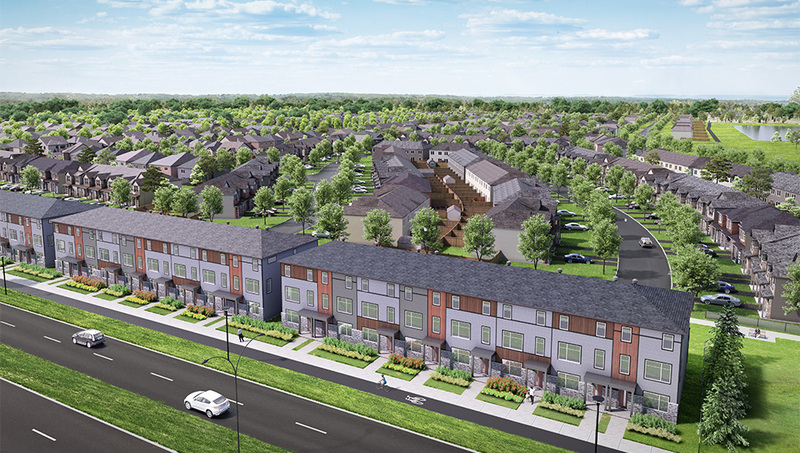 Rear-lane Townhomes are returning to Arcadia, bringing three stories of modern, stylish living right along Campeau Drive. These Townhomes will feature large windows and open-concept floor plans, making them a great choice for first-time home buyers or those looking for a more low-maintenance home. In addition to our collection of favourites, expect some new Single Family Homes to be available in Arcadia, like The Clairmont and Frontenac. offering superb designs on 30’, 36’ and 43’ deep lots. Be sure to tour the Model Homes in Arcadia and the Model Homes in Avalon Encore, Orléans to get a feel for the potential of your brand new home. New Executive Townhome designs, such as, the Laguna and Citrus models will also join the collection in the next stage of Arcadia. Our Townhomes are expertly designed around an open-concept floorplan with large windows and a great flow from room to room, not to mention a finished basement for even more room to stretch out. Tour our Executive Townhome Model Homes in Avalon Encore, Orléans. Be sure you’re signed up to receive all the latest Arcadia news and announcements as we get closer to the next release this spring.